Remnants of the Samoa tsunami arrived here at 8am this morning. We’re fine – watched the water go up and down about 2 meters at our mooring in a small bay near Neiafu, and it was seriously bizarre. Just sending this off quickly, and will describe all in the blog shortly. Our plans have changed – again- because there have been so many delays up to now that we’re at least 6 weeks behind our original schedule. So the Cook Islands, Samoa, even Niue are off the itinerary and we’ll be spending the last weeks of our trip in Tonga – specifically, in the Vava’u Group of islands – before heading for New Zealand. The Captain feels strongly, and I agree, that it’s better to explore one area than spend all our time sailing between many places without really seeing any of them properly. 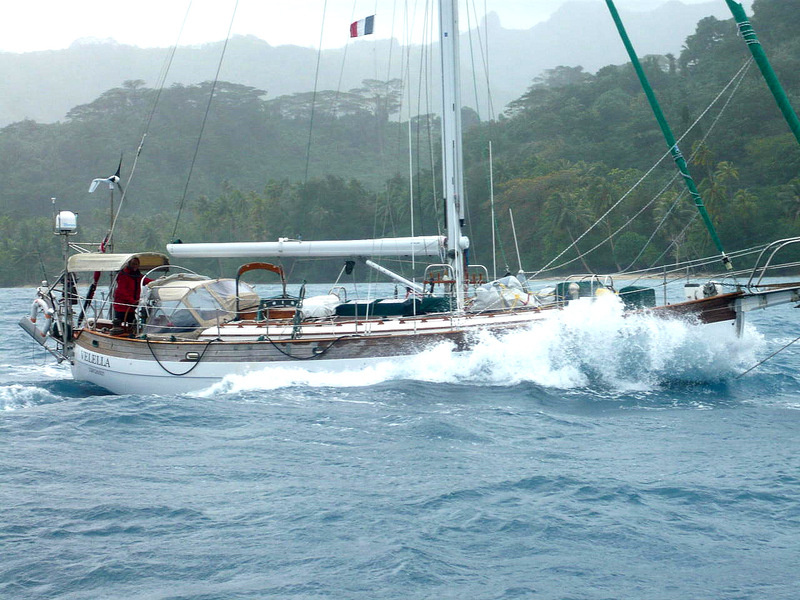 We’re now en route from Bora Bora to Tonga, a distance of about 1,250 miles, and should reach Neiafu in about 5 days, assuming the winds remain favourable. We’ve had an OK passage so far, with only a few days of too little wind or too much. The swells have been enormous. On one day, although the sea was calm, the swells were so huge and the distances between them so long, that the surface of the sea looked more like a landscape of slowly moving hills and valleys than water. These swells come all the way up from the Southern Ocean and I wouldn’t have liked to have been there for the storm that caused them! Nothing seems to have broken down so far either. Except the fridge, of course, which goes on strike at irregular intervals for no reason The Captain can discover. I maintain it’s sheer malignant perversity or possibly the desire for a better class of electricity. 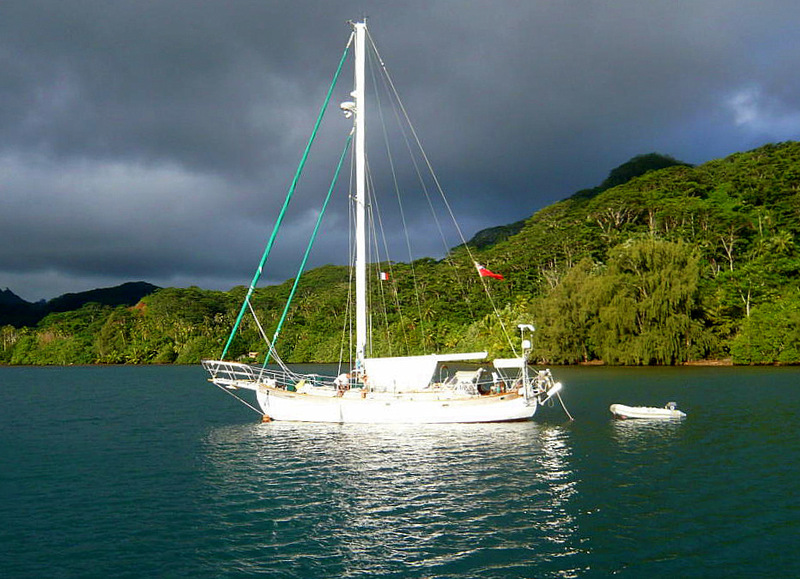 We stayed rather longer in Taha’a than we had intended, thanks to high winds and seas and pelting rain that lasted 5 days and forced us to remain on a mooring buoy until they abated enough for us to set sail for Bora Bora with some degree of comfort and safety. 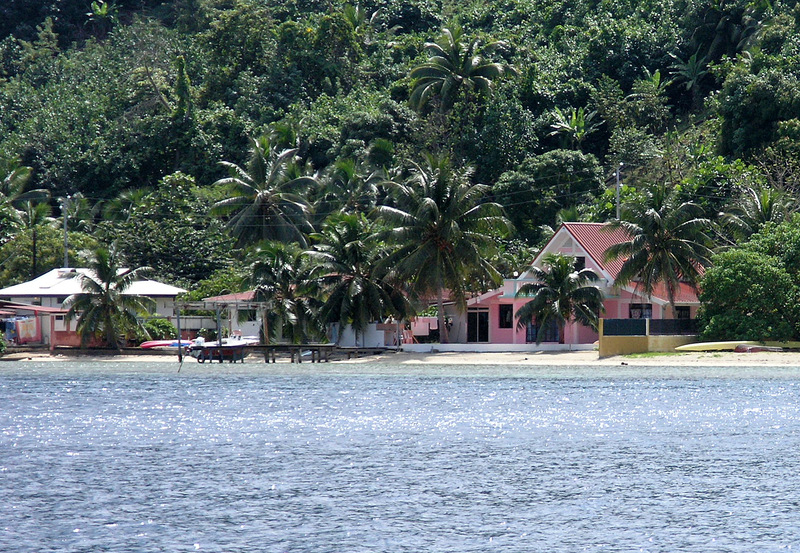 Even before that, the weather had been more boisterous than usual, and there was no point trying to get to one of the tiny islets that are so picturesque, as no anchorage there would have been safe to spend the night on, and certainly snorkelling was out of the question. So we moored in a couple of pretty bays and had a perfectly delicious meal at a restaurant run by a chef from Normandy who served us Mahi-Mahi with vanilla sauce – which sounds very peculiar but is much the same kind of improbably delicious combination as are foie gras and Sauternes. 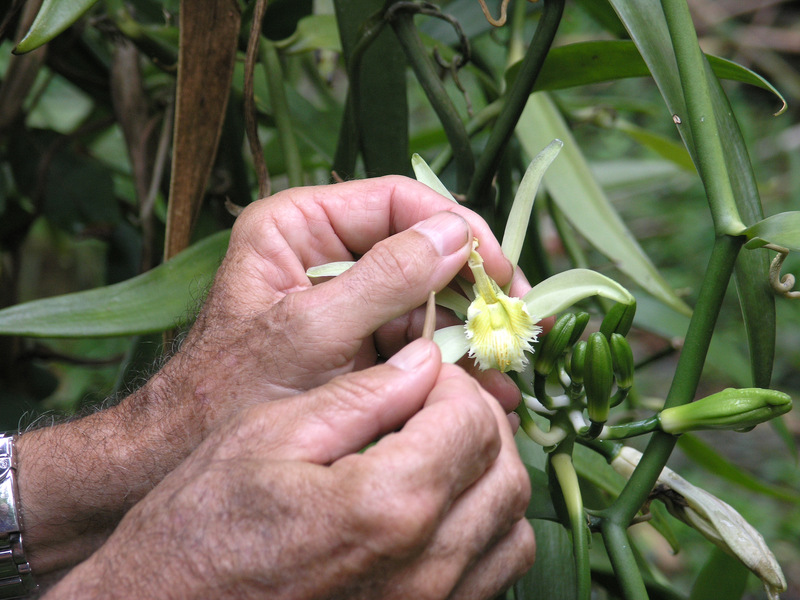 Though water sports were off the activities list, we went on an ethno-botanical tour of Taha’a given by Alain Plantier, a fervent amateur botanist, who took us to the interior of the island by way of his vanilla plantation. 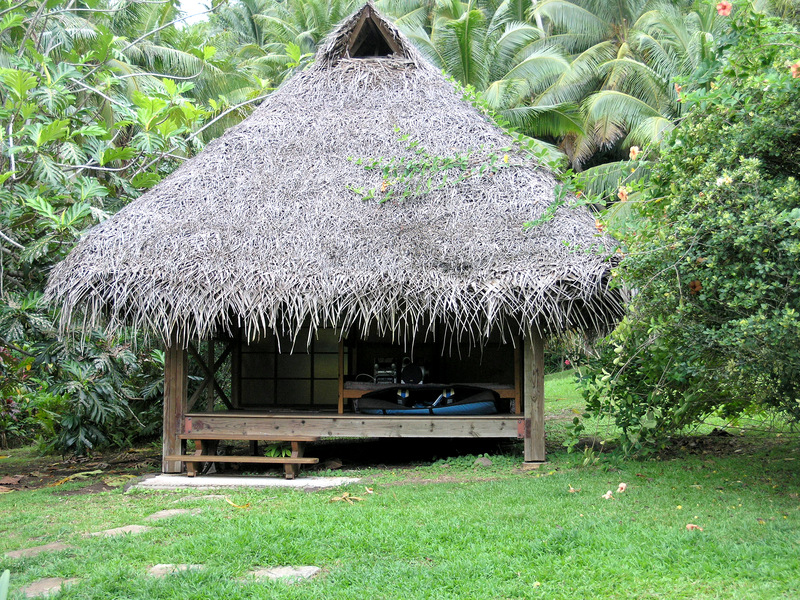 ‘Vanilla Tours’ had been recommended to us, and I had met Alain’s wife over a lunch of poisson cru at the Tahiti Yacht Club. Luckily, we were able to book just before the weather turned fierce and there was only one other couple with us. It was genuinely worthwhile – even according to The Captain, who tends to look askance at tours and suchlike herd-activities. Alain und Cristina Plantier moved to Taha’a from France some 30 years ago “to raise babies and a garden” after falling in love with French Polynesia. They’ve lived on the shore of Hurepiti Bay ever since, without electricity or running water until only about 5 years ago, and built their home themselves in the traditional native style: a separate house or ‘Fare’ for each daily activity – sleeping, cooking and living, bathroom, workshop, etc. and, later, a separate ‘Fare’ for each of their children. The whole is a collection of palm thatched, woven bamboo-walled dwellings half open to the outside world and tucked into a beautifully lush garden, connected by paths that wander through flowering hedges. It’s a kind of architecture perfectly suited to the climate, and one in which inside and outside are a matter of degrees of airiness rather than rigidly defined spaces. Alain began the tour by explaining how the roofs and walls had been woven, and went on to talk about the various plants that had been brought to the Polynesian islands by the original settlers from Asia thousands of years ago and how they were used. We then walked on to their small vanilla plantation, where he demonstrated why vanilla costs so much. For one thing, the vines are about 3 years old before they begin to flower – and that’s after the ‘tutors’ or supporting small trees have grown up. For another, the whole process is so labour intensive that it’s a wonder the finished product doesn’t cost even more. 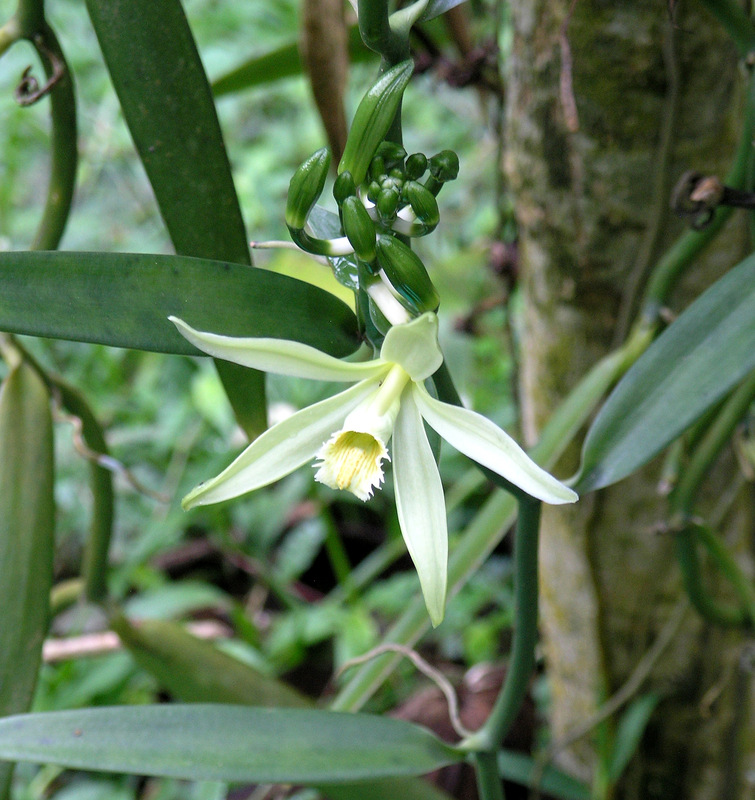 Vanilla planifolia originates in Central America and was first brought to Europe by Hernan Cortez in 1518. The Aztecs had used it to flavour drinking chocolate and called it ‘Tlilxochitl’, and thought it had magical powers. Although attempts were made to grow the orchids in many other suitable climates, the Spanish were able to maintain a monopoly on vanilla production for many years because only one kind of bee – which refused to thrive away from its native habitat – is the primary pollinator. Eventually a 12 year-old slave in Reunion, a French colony in the Indian Ocean, discovered a way to pollinate the orchid by hand and since then it has been grown wherever climate permits. 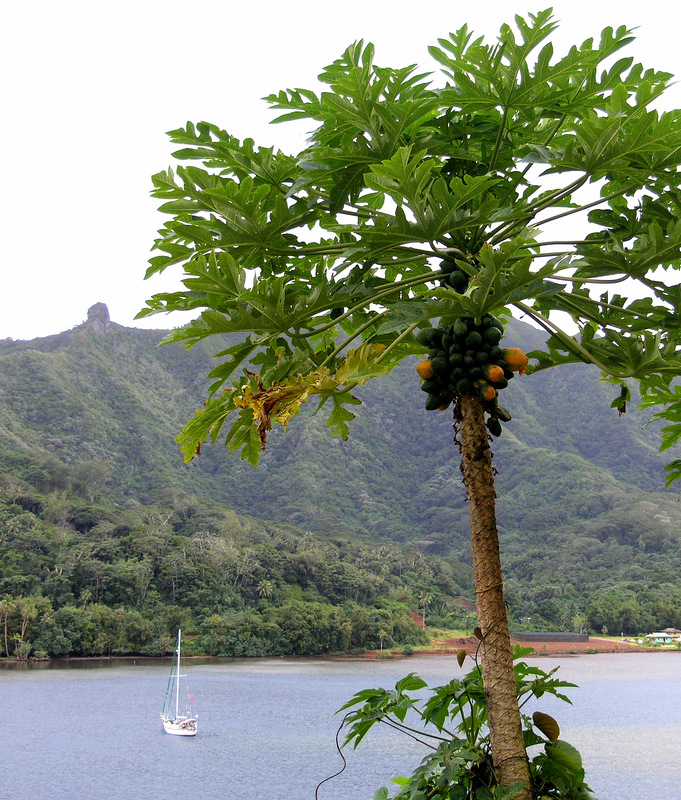 Taha’a produces most of the vanilla grown in French Polynesia, and during certain times of year the whole island is said to be pervaded by the scent. The blossoms are still all pollinated by hand, using a tiny stick to transfer the pollen to the stigma, between 8 and 12 hours after the blossom opens. After that ‘window of opportunity’ the blossom wilts and dies. We were told that in some of the plantations on Taha’a up to 12,000 blossoms will open every day, all of which need pollinating if they’re to produce a pod! After pollination, the pod begins to grow where the orchid blossom was. The green pods look like bunches of extra long, extra fat, shiny green beans 6-10″ long, and smell of nothing at all. Six months later, once they’ve ripened and turned a light brown, they’re ready to harvest. The pods are left to dry in the sun for about 4 hours a day on cloths. After the daily drying the cloth and pods are folded and left to sweat and ferment. The next day, the cloths are unfolded and the accumulated moisture is evaporated in the sun again. And so it goes for many weeks, until a specific, very low moisture content is reached, the scent has developed and the pods won’t mould. The next part of the trip consisted of a very bumpy Jeep ride up through the central part of the island on a dirt road that began well, but turned to deep red mud as we drove higher. 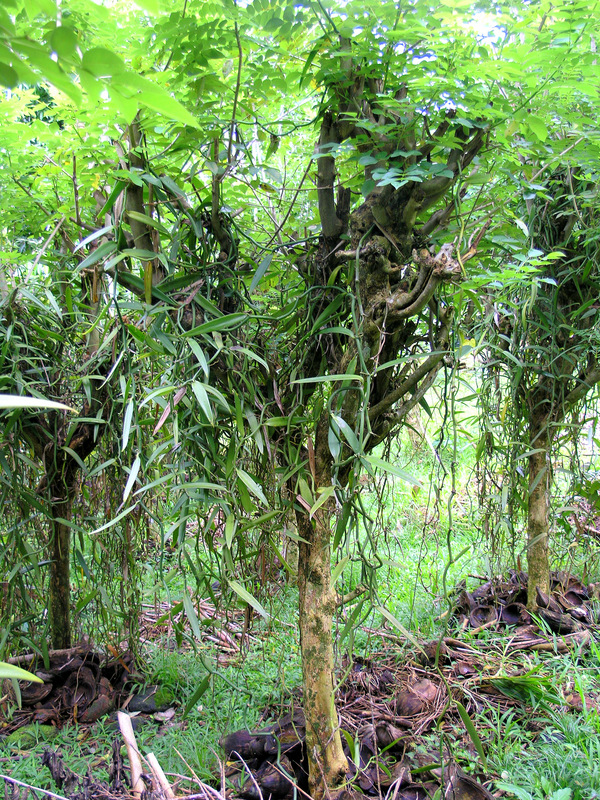 The vegetation became wilder and more jungle-like. 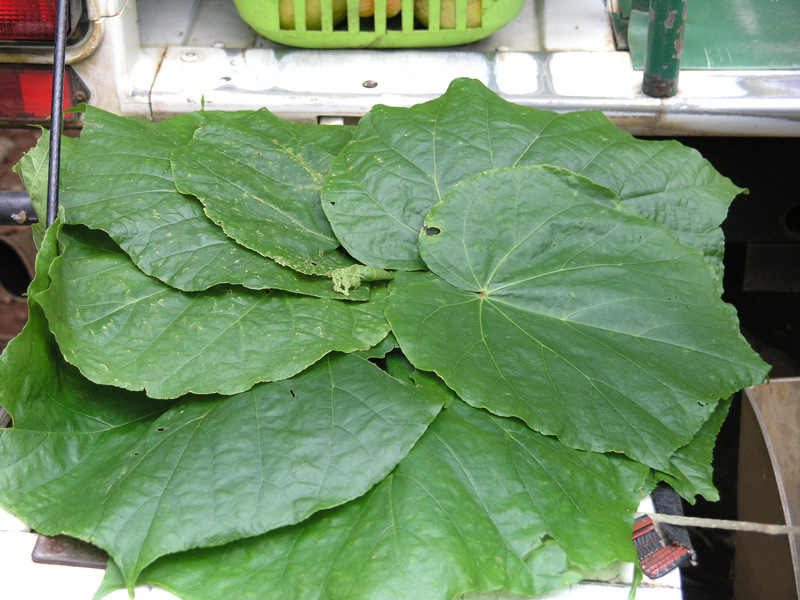 Plantations of vanilla vines, coconut, papaya and banana trees were joined by wild hibiscus and enormous ferns and plants with leaves like elephant’s ears. Tall trees with lacy foliage towered over all, creepers crept, and bird-of-paradise blossoms glowed like flames in the deep shadowed under-brush. At several points we stopped and our guide demonstrated uses for the various plants we saw growing by the roadside. The plates he made of wild hibiscus leaves pinned together with small twigs, would do nicely at any domestic western barbecue should one be short a few of the cardboard variety! We ended by driving along the coast road, where a series of minuscule fishing villages clung to the shoreline. The inhabitants live off the fish they catch and, for the most part, eat the vegetables and fruit they grow themselves. It’s a subsistence economy, which explains why there’s so little fruit to be had in the shops despite the wealth of fruit trees on the island. Bora Bora was only half a day’s sail away, so we were able to leave Taha’a at a civilised time of morning. We entered the main entrance to the lagoon to the accompaniment of 35 knots of wind – regrettably, this seems to have become a tradition when we come into harbours! We anchored on the second try without much trouble, though I had to steer the boat ’round and ’round for 15 minutes while The Captain untangled the anchor chain, which had got snarled in its locker.